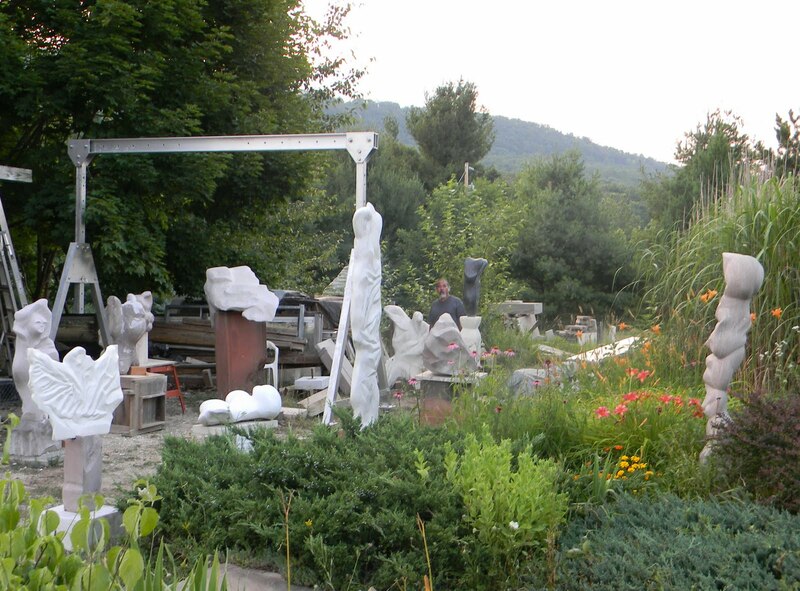 Planting sculptures can be as easy as setting something freestanding on the ground, grade or grass or more complicated if the Art needs a base for balance or permanent placement. I like to think of it like the flowers in the garden: will it be an annual or perennial? If an annual, than just setting it outside may be enough, it's accepted that stuff may happen as time and weather changes, a bloom only lasts so long, if a perennial than there are more complicated considerations. For outdoor Art to last season after season the object needs to be understood a little differently. Weather and changing soil conditions are a constant worry. In high winds things can be blown over and in cold climates frost heave can move and topple most sculptures. Ideally, the connection between the Art and earth should have roots, like plants. Generally, a concrete or stone base on grade is a minimum with a foundation or footer below the frost line a step up. The above 1st photo shows two bronze sculptures, Leonard Baskin: Hephaestus, 65 1/8" X 20 7/8" X 18 7/8" @ 593 lbs. and Jean Ipousteguy: Man Passing Through the Door, 77 1/4" x 54 1/4" X 46 1/2" @ 1359 Lbs. Each is installed on granite pavers over gravel. The Baskin sculpture is attached to a granite base paver with a stainless steel rod/ pin laid on the granite patio dry, without mortar or epoxy. Because of the weight and base design of the Ipousteguy, this sculpture was allowed to sit on the granite patio without pins or base stone. The second photo shows a bronze sculpture by William Tucker: Gymnast 111, 88 3/4" x 60 3/4" x 36 1/8" @ 1032 lbs. It is installed directly on gravel, freestanding, with no pins. If unsure, on heavier,complicated or difficult Art, an engineered solution by a structural engineer or Art Installation Specialist,complete with drawings, details and materials is highly recommended. Remember, sculptures can be large, heavy and dangerous, safety for the Art, Art Handlers and everybody else involved, from client to casual viewer, is first. The above bronze sculpture is by Raymond Mason: Falling Man, 48 1/4" x 10 1/8" x 27 5/8" @ 865 lbs. It sits on a stainless steel powder coated pedestal I designed. The client asked to see the landscape through the sculpture. The feet of the pedestal sits on a bed of gravel with no concrete foundation. The client understood the sculpture is subject to ground movement, freeze thaw cycle, but they were comfortable with knowing that and had the means to adjust as necessary. This last sculpture is by Olafur Eliasson: â€œLarge Compassâ€, it consists of lava rock, steel and aluminum. This was a complicated piece. It came from Germany, and a studio assistant of the artist flew in to oversee it's installation. The sculpture was to be installed in a patio. A landscape architect had already made early decisions as to where and how. 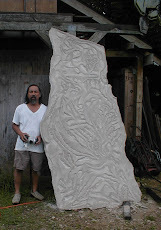 Concrete had been poured based on a structural engineers plans and I was brought in to place the sculpture exactly. Logistically, we had to rig the crated object first over limestone steps, the legs of the gantry were set at different heights with the i-beam level. The lava rock weighed a ton and was carved like a pendulum or plumb bob. The design of the handling frame was amazing. A threaded rod was attached to the stone and held to a structural steel beam above it. Turning the rod clockwise like a screw raised the stone enough so that we could partially remove the bottom of the frame it was sitting on. Turning the rod counter clockwise lowered it to the concrete base where we could find perfect plumb and locate where to drill the concrete to pin it. The difficulty was in the final adjustment of the sculpture, by millimeter. The Artists's assistant told me it had to be placed perfectly due north. The lava rock was magnetic and the steel needle attached by a rod in the center of the stone was to be oriented in one direction only. He brought out his compass and we fiddled to get it right. I remember after a while he said OK, but he was still perplexed. I asked what else could we do? What he was using was a professional, German made compass, we had to trust the tool. He looked at me and said he noticed I had an iphone, had I downloaded the compass app by chance? I smiled, apologized, I hadn't. Here's one of my sculptures, planted in that spot about 8 years ago. Pink Tennessee marble, the top stone is pinned to the bottom stone and it sits on a 7/8" flagstone laid on the tamped garden topsoil. I look at it every now and then to see if the earth moved under it and adjust as necessary.